Three Students Attend Presidential Search Committee’s Final Open Forum | The Gettysburgian. Only three students, one of whom was The Gettysburgian’s staff writer, attended the Presidential Search Committee’s forum for students to share their thoughts on a new president, which was held Thursday afternoon, Sept. 6. This was the committee’s second forum for students following the announcement of President Janet Morgan Riggs’ retirement. In addition to student forums, the PSC, in concert with the Russell Reynolds search firm, has sought in put from a variety of campus constituencies and will now move its focus towards drafting the job description and recruiting candidates to apply. According to Charlie Scott ‘77, Chair of the Presidential Search Committee and Executive Vice Chair of the Board of Trustees, the committee is hoping to commence interviews in the winter in order to announce the president in the spring. 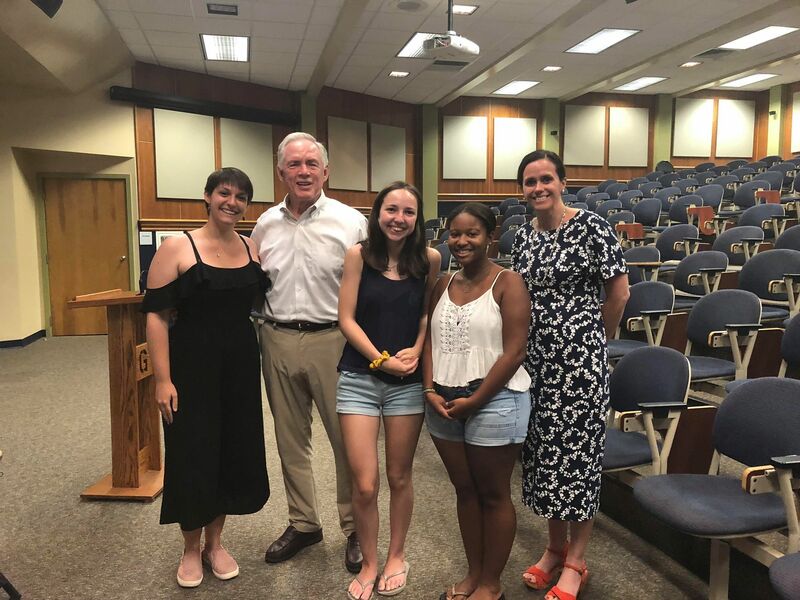 Those who attended the meeting were students Molly O’Gara ‘22 and Maliyah Peacock ‘22, both of whom were interested in what insight the forum would give students, as well as how the quest is going. The leaders of the meeting wanted to gain more knowledge about what students desire in an applicant, and they had four questions they wanted attendees to answer: What should be the top priorities of the next president? What challenges will that person face when they get here? What experiences would you like to see on a resume? What kind of personal attributes and characteristics should the candidate have? The two students in attendance engaged in intensive and thought-provoking conversation with Sarah Tokar ‘19, student representative of the PSC, in addition to Scott and Jennifer Lucas, the co-director of Human Resources and the search coordinator. Peacock wanted to ensure that the next president is acquainted with the campus and will try their best to make connections that establish strong vocational aspects of students’ education. O’Gara expressed her desire for the priorities of the new candidate to be club experience as well as school pride. Both agreed that students should be the president’s primary concern, meaning that students’ happiness and success should be two items the candidate works to guarantee. On the topic of challenges the new person will face after arriving on campus, the first-year students admitted they are unaware of many issues that arise at the college. Subjects such as sexual assault, social injustice, fraternities and sororities, the rising cost of a college education, and Gettysburg’s sense of community were all mentioned as potential challenges awaiting the new president. the reasons. Jennifer Lucas asked the pair why they chose Gettysburg, to which the two replied that financial aid, the connections, and small campus life were all impetuses to commit to Gettysburg. The resume of the candidate was discussed as well, as the search committee would like to know what parameters students are setting in terms of education, volunteer experience, former jobs, etc. Feedback included leadership experience and good public speaking skills as essential requirements for the candidate. Regardless of what might make a candidate seem superior to other applicants objectively, the pair wants a person who will care about them, accept diversity, and work to make the college a better environment.